Five months ago, I discussed considerations for selecting the right cymbals for your sound, and I also shared my cymbal set ups at the time. Since then, I have found myself playing my Paiste 2002 set up a lot more often than my Zildjian K/A Custom set up. Recently, I tried out a few cymbals in the Paiste Signature line and I like them even more. Of course, Rythym Dog recommended Paiste Signatures to me a few years back and as always, it was a great recommendation! I'll admit I've become a bit of a Paiste fanboy. There is a lot to love about their cymbals, mainly, (1) they have a smooth sound that is never harsh, and (2) their production processes result in a consistent sound from cymbal to cymbal for a given model. For my typical pop/rock set lists, the Paiste 2002s always seems to be the right sound. The challenge with high-end Paistes, such as the Signature line, is that they are very expensive. Signature high-hats and rides run into the low-to-mid $400s new. So, those of us without Paiste endorsements and/or mega recording deals are left to pick up "Sigs" on the used market. Fortunately, there is no shortage of used Sigs for sale on eBay, where they often sell at 50 percent below new prices, bringing them within reach of us mere mortals. Over the past month, I picked up a set of 13-inch Signature Dark Crisp Hi-Hats, a 20-inch Signature Full Ride, an 18-inch Signature Fast Crash, and a 10-inch Signature Splash, all purchased used on eBay. While these are not the first used cymbals I've purchased, they are the first I've purchased used on eBay, and I learned a couple lessons the hard way. In this post, I will share those lessons with the hope that it helps other navigate the process of evaluating and purchasing used cymbals. The first big lesson I learned is that is that fast or thin crashes and splashes have a tendency to warp, and sellers are unloading them without mentioning that they are warped. I bought and returned a 16-inch Signature Fast Crash after hanging it on a stand and noticing that when viewing the cymbal edgewise, the outside edge was not flat/true--the distance between the highest and lowest points was nearly an inch. You can also catch warpage by spinning the cymbal in a level position and watching to see if the outside edge rises and falls as it travels around. The 10-inch Signature Splash I purchased is warped as well. While the seller of the 16-inch Signature Fast Crash allowed returns, the seller of the 10-inch Signature Splash did not--it's all mine. It's unclear whether minor to moderate warpage has a significant effect on a cymbal's sound, but no one wants to pay good money for warped cymbals! I believe that warpage is far less common on heavier weight crash cymbals, rides, and hi-hats, but it is something to ask about before you buy. Another big lesson I learned is that some eBay sellers will describe flaws their cymbals do not have, but fail to describe the flaws they DO have. For example, my 18-inch Signature Fast Crash was described as being in "used...in excellent condition," with "no cracks or keyholing." 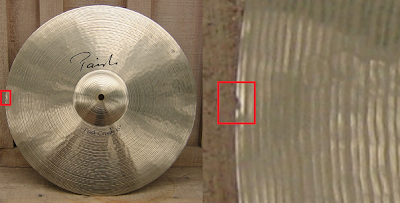 That's great--the cymbal is not cracked, and the center hole has not been deformed. However, upon receiving the cymbal, I was a bit disappointed to find that it had multiple "flea bites," tiny dings in the edge of the cymbal. A flea bite can range from very light scoring that leaves only a rough texture on the cymbal's edge to a very small but visible indentation or chip that looks like a flea took a "bite" out of the edge, sometimes leaving a small ripple as your eye runs across the bow of the cymbal toward its edge. Severe flea bites can lead to cracks, but in most cases, they are primarily a cosmetic concern. In the case of my cymbal, the flea bites don't hurt the sound or playability of the cymbal, but I would have dropped out of the bidding sooner had I known that the cymbal was not actually in "excellent condition," or at least what I consider to be excellent. While this flea bite may not affect the sound of the cymbal, the cymbal should not be represented as "like new" or "excellent condition," and you should reduce your maximum bid accordingly. If the photos of the cymbal aren't clear, or if they don't cover the entire surface of the cymbal, ask the seller to post more photos. You should be cautious if photos for a cymbal listing omit a portion, or portions, of the cymbal. Used Paiste Signature Full Ride 20"
Fortunately, the used 13-inch Signature Dark Crisp Hi-Hats and 20-inch Signature Full Ride that I purchased on eBay arrived in excellent condition as described. The Sig ride is a real beauty as you can see in this photo. New, this cymbal is priced around $420. I purchased this used 2006 model for $250 with free shipping, an outstanding deal for a top-of-the-line ride cymbal. It arrived pretty dirty, since many drummers do not clean their cymbals. I decided to clean this one up--some light scrubbing with Paiste Cymbal Cleaner followed by an application of Paiste Cymbal Protector produced the results you see here. While some eBay sellers offer a return policy, most do not. Without a return policy, if the description of the item is accurate, you have little recourse if you receive a used cymbal that does not meet your expectations. Don't be shy about asking questions upfront, or asking for additional photos, to get as much information about the true condition of the cymbal before you decide to bid. Once the seller has answered all of your questions, and posted clear and complete photos for the listing, you can then bid on the used cymbal with confidence! For tips on using cymbal makers' websites to evaluate cymbals, and tailoring searches for specific types of cymbals on eBay, see Paiste Signature setup.